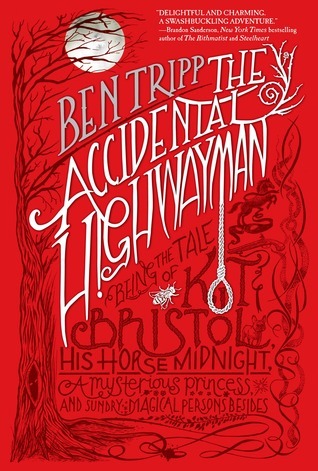 So, I’ve heard nothing but good things about The Accidental Highwayman: Being the Tale of Kit Bristol, His Horse Midnight, a Mysterious Princess, and Sundry Magical Persons Besides by Ben Tripp. Recently some of the hyped books have been a miss for me so I was hesitant to read this. However, this book deserves all the hype and so much more. Mr. Kit Bristol, 16 years old, is an indentured servant to an impoverished gentleman. His life of buttered ham sandwiches suited him quite well despite the fact he was bored. Then one night his life is turned upside down when he has to flee for his life and encounters all sorts of interesting magical creatures along the way. Kit gets mixed up in a mission to rescue a princess and nothing but awesome whittiness and action ensues. The Accidental Highwayman represents both a nod to literature and stories of days past. It not only invokes humor but adventure as well. While I fell in love with the whit right away, it was the well-crafted adventure story that kept me interested. I love and appreciate the use of language (vocabulary) in this story, I’m pretty sure I learned a few new words. The illustrations throughout the book are also impressive. While, yes this is a YA novel, I really think that adults will equally enjoy it. This is definitely a smart tale and it takes you on a fun, wild ride until the very end. I never knew where Tripp was taking me but I loved every minute of it. This is book 1 of a trilogy and I can’t wait to read the next one. This entry was posted in Fantasy, Magic, Young Adult and tagged Adventures of Kit Bristol, Ben Tripp, The Accidental Highwayman, The Accidental Highwayman Being the Tale of Kit Bristol His Horse Midnight a Mysterious Princess and Sundry Magical Persons Besides, Young Adult, Young-adult fiction. Bookmark the permalink.